Chromebooks have been around for years, but we still meet plenty of people who don't know what they are. If you're going to buy a laptop, it might as well be a Windows 10 one, right? Wrong. If you only have £200-odd to spend, something like the Acer Chromebook 11 N7 is almost certainly going to be more fun to use than a Windows machine limping along with a 0.1-horsepower Intel Atom CPU. The special sauce in this particular Acer Chromebook 11 is its strength. Military-grade ruggedness means the N7 can pretty much survive being thrown through a wall. Acer Chromebook 11 N7 review: What's different about Chromebook? Herein lies the question many wonder: how does a Chromebook differ to a Windows laptop? It's all in the software: with Chrome OS on board, this Acer can't install Windows applications. You do get Chrome's standard array of Google apps, the same suite of Office-a-like apps you get in an Android phone plus Maps Photos and a few other bits. So it's ideal for education. Chrome OS is at its happiest when connected to the internet, but you can also write documents, play certain offline games and watch locally-stored video when there's no Wi-Fi. One of Chrome's more recent additions is support for the Google Play app store - just as you would get from an Android smartphone or tablet - which should expand the array of apps available for this OS platform. However, it's not available for the Acer Chromebook 11 N7 yet. Acer says it's coming in an update, but you may be in for a bit of a wait (and for the Chrome geeks out there: yes we tried the Dev and Beta builds of Chrome, and Google Play isn't available in any of them yet). As is, the Acer Chromebook 11 N7 is therefore a useful but pared-back laptop. The software is friendly, feeling like an Android version of Windows properly designed for use with a keyboard and mouse. Let's be straight: the N7 is pretty boring-looking, right? Featuring a sea of grey plastic whose only texture beyond a general rough finish is on the bottom; we presume the diamond embossing on the undercarriage is designed to make the little thing stay on your knees better. It's not unattractive, mind, and its curves give the Chromebook 11 N7 a sort-of friendly look. We imagine this Acer will end up in classrooms across the land (as long as they get their orders in before the Tories cut school budgets completely, anyway). If you must have a bit of bling to you laptop, Acer also makes a metal Chromebook for the same price. The big claim here is that the Chromebook 11 N7 has been MIL-STD 810G tested. That's a military-spec set of tests that includes "high and low temperatures, humidity, vibrations, mechanical shocks on drops, rain, dust and sand". And unlike some rugged gear, this one has actually been tested by a third-party lab. The downside? It's chunkier than most and, at 1.3kg, isn't light for a 11-inch laptop. Don't underestimate the value of the Acer Chromebook 11 N7's ruggedness if you're not buying for an unruly brat, though. The keyboard is designed to take up to a can's worth of liquid without letting any of it getting to the insides, and this little guy feels exceptionally well-made for a computer that's so affordable. You can really feel the difference as you use the Acer Chromebook 11 N7. The keyboard surround is very stiff, more so than some fancy metal laptops costing over £1,000 that we've reviewed recently. This feeds into what we think is the best part of the Acer Chromebook 11 N7: the typing experience. The ultra rigid insides and a frankly brilliant-for-the-price keys make this one of the best typing experiences you can have in a £200-odd ultraportable. Despite having just an 11-inch screen, the keyboard doesn't feel cramped. We wrote this review using the Acer Chromebook 11 N7, and it honestly didn't feel like much of a downgrade coming from our day-to-day MacBook Pro. If you want cheap laptop to start writing that novel you've always wanted to churn out, this is a great place to give it a go. The trackpad below is less impressive, but only because you can't really recreate the feel of a high-end pad at this price. Expensive laptops use textured glass panels for the bit you actually swipe your finger across, but in this Acer you get plastic. It feels about as close as plastic can get to glass, but the friction is a little different, feeling less smooth when your finger changes direction. You won't find much better at the price, mind. The Acer Chromebook 11 N7 also has plenty of connections, as long as you're not too bothered about having the very latest standards. There are two USB 3.0 ports, an HDMI video output and a full-size SD card slot. These are what we use 99 per cent of the time, although it would have been good to see a USB-C jammed-in here too. They're not much use at present, as even the USB-C phones tend to have cables that end in full-size USBs right now, but the future is almost certainly USB-C-shaped. There's also a Kensington security port on one side. And if you don't know what one of those is, you probably don't need to worry about it. The Acer Chromebook 11 N7 is a real hardy "meat-and-potatoes" pub lunch of a laptop. There's nothing fancy going on, but it's satisfying and the price is right. As with just about any laptop this price, the screen probably won't blow you away, though. It's an 11.6-inch LCD. Its sharpness, viewing angles and colour aren't as good as those from, for example, an iPad. You can see the Acer's pixels pretty clearly, although the effect isn't all that different from looking at a 1080p 15.6-inch screen. Colour is a little undersaturated, but not so severely that people's faces will look totally lifeless if you watch a movie on the N7. Similarly, top brightness won't scorch your eyeballs, but because the screen has a matte finish rather than a glossy, reflective one, you can get away with using this laptop outdoors without the display being impossible to make out. The Chromebook 11 N7's screen tilts back an awful lot - more than 180 degrees - but doing so also shows off the contrast shift typical of TN panel like this. Colours invert, everything starts to look shadowy. However, viewing angles aren't so terrible you need to look at the display dead-on for it to look right. This isn't a great screen, but we don't expect much more in a laptop this cheap. There's a version of the Acer Chromebook 11 N7 with a touchscreen, but ours is a plain old non-touch one. Giving it a prod just to check, the Chromebook's toughening seems to extend to the screen too. It feels sturdy. The real benefit of a Chromebook over a normal Windows laptop is that it can get by with a true low-end CPU without running like a dog, and it much less storage space. This laptop has an Intel Celeron N3060 processor with 4GB RAM and a 32GB solid state drive. That CPU is a little old and a lot low-end. It was released in early 2016, and Intel has already made a new family of N-series CPUs, including the N3350, that Acer has already plugged-into some of its other £200-ish laptops. It's still low-end, but is newer and faster. The N3060 is a dual-core Celeron processor with a base frequency of 1.6GHz. While using the Acer Chromebook 11 N7 to write documents and search the web, its performance is fine. There's none of the basic lag that makes using a Celeron-powered Windows 10 laptop such a trial. However, start doing something a bit more challenging and you'll find the Chromebook's limits pretty quick. There are Chrome games, for example, and there's pretty serious intermittent frame rate drops in most of the ones we tried: Spelunky, Portal 2D, Gore Script. Cut the Rope runs pretty well, perhaps because its code is better-optimised. The Acer Chromebook 11 N7 also lasts a good while between charges, although not that close to Acer's claim of 13-hours. Using it as our usual day-to-day PC, connected to the internet and skipping between browsing and using Google Docs to write, we got around 8.5-hours use from a charge. That's enough for a good day's work, but not world-beating. Finally, the Acer Chromebook 11 N7 has a pair of speakers, one on each end of the underside. The sound is quite boxy-sounding, with little bass and limited treble. However, that's still better than a thin, caustic sound and the maximum volume is decent. We don't tend to torture our laptops too much, but the tough design has real benefits for actual use, levelling-up the typing experience. This is a great little typing machine. The screen is only fine, it could really do with the newer, slightly more powerful Celeron processor Intel has already released, but if you just want a computer for the basics this is a good choice. 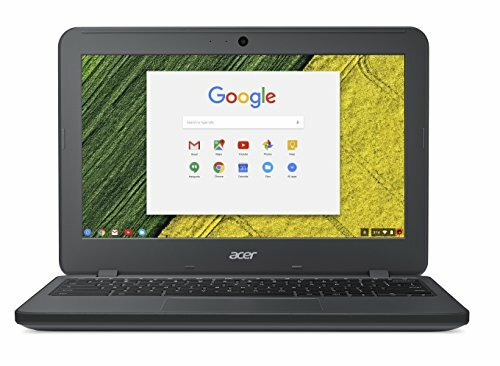 One of the best alternatives to the Chromebook 11 N7 comes from Acer. The Chromebook 14 is larger, has an aluminium body that looks and feels a lot fancier. And the latest version has a better 1080p IPS screen that will get you much better viewing angles. At just £30-40 extra, the Chromebook may be a better buy if you don't mind having a larger laptop. It's also more powerful, using the quad-core version of the N3060 used here. Make sure you look for the 1080p version, though, as there's a 1366 x 768 model too, which will look super-pixellated. As it doesn't have the military-grade rugged spec of the Acer, this Chromebook is significantly lighter, at under 1kg. How much are you going to abuse your laptop? The 4GB RAM version is roughly the same price, so there's no advantage there, and it has less storage too, 16GB. It uses a Rockchip processor rather than an Intel one. They're generally less well-regarded, but as it uses a very phone-like graphics chipset it may well fare better with Android apps. What do you get if you spend real money on a Chromebook? The Asus C302CA doesn't feel too far off a MacBook in its construction, with metal used throughout. Its screen is also far better, and flips around for some hybrid-style antics. Performance with more demanding apps and games is also a lot quicker as it has a premium Intel Core m3 CPU rather than a cheap Celeron model. At more than double the price, and with a similar typing experience you have to wonder whether all the extra money is worth spending if all you need is a typing machine, though.